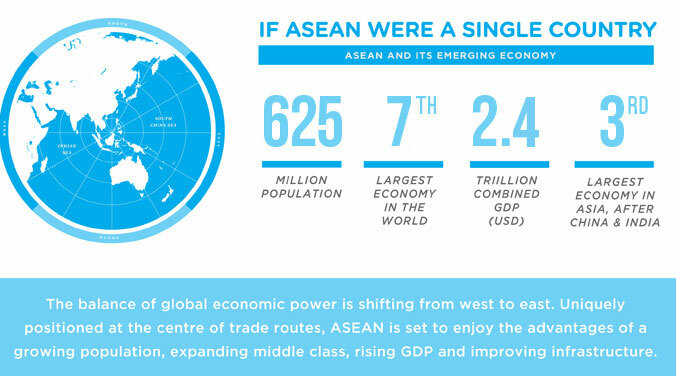 ASEAN has witnessed impressive growth over the last 20 years. Its total GDP has more than quadrupled since 2001 and its growth level has exceeded the average global growth for the past ten years. Due to the region’s strong performance and growth potential, ASEAN has been an increasingly popular destination for foreign investment. Just in the years 2011 to 2013, ASEAN has attracted US$334.2 billion in FDI from many source countries, including the EU, Japan, China, Hong Kong, and the US. With increased integration, intra-ASEAN investment continues to grow as well. In 2013, intra-ASEAN investment reached US$21.3 billion, up from US$15.2 billion in 2011. The large, fast-growing, and young working population in ASEAN will give the region a demographic advantage in the coming decades. The pace of change in ASEAN is accelerating, driven by powerful economic, political and demographic trends. 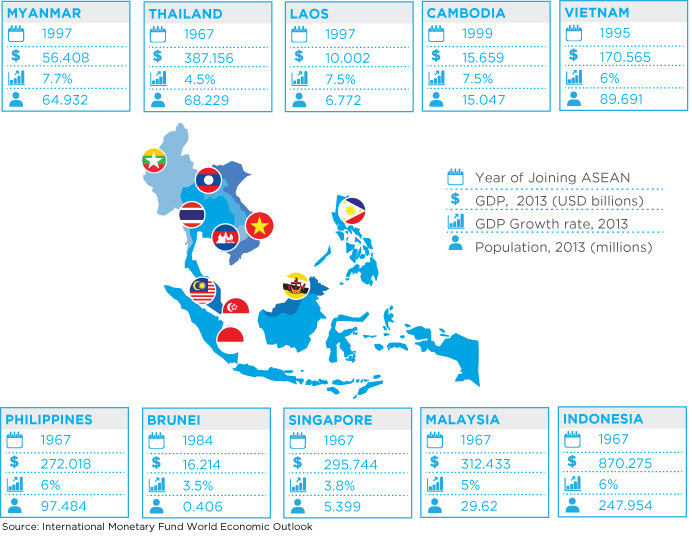 ASEAN5’s economy has gradually shifted to the tertiary sector. The BCLMV countries are currently developing their secondary and tertiary sectors. As global trends shift towards Asia, ASEAN is uniquely positioned geopolitically and economically to leverage its advantages. Infrastructure financing and emerging sectors offer potential. ASEAN is set to enjoy the advantages of a growing population, expanding middle class, rising GDP and improving infrastructure. The ASEAN Economic Community (AEC) is one of the three pillars of ASEAN and is the realisation of the end goal of regional economic integration by 2015 of the 10 nations.